Benner’s Prophecies of Future Ups and Downs in Prices - IFA Vintage and Current Book Library - Index Fund Advisors, Inc.
Notes: Also see SEWELL, Martin, 2011. History of the efficient market hypothesis. Research Note RN/11/04, University College London, London. 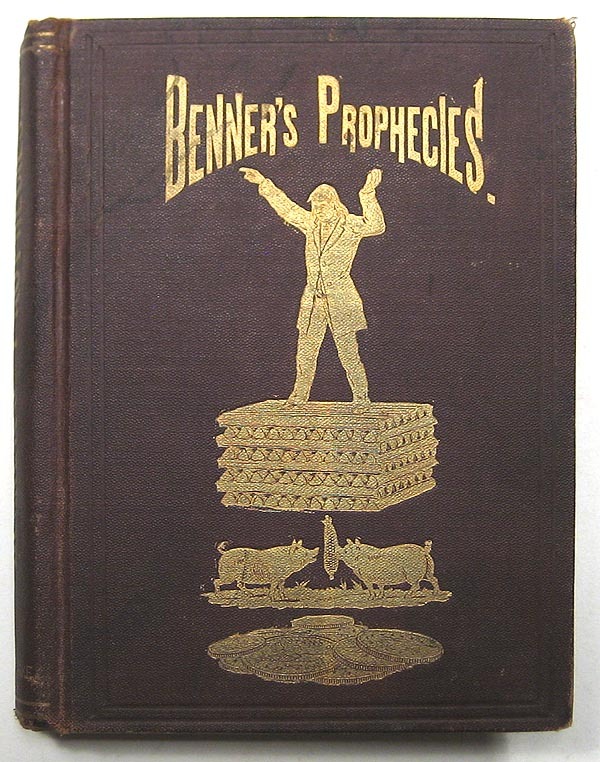 Benner's Prophecies of Future Ups and Downs in Prices by Samuel Benner What years to make money on Pig-Iron, Hogs, Corn, and provisions. Book written by Samual Benner, an Ohio farmer. Published by the author, Cincinnati in 1876 and copyright 1875. Small 8vo (5 3/4 x 4 inches). First edition, green cloth, red edges. Collated and complete. Original green cloth with elaborate gilt front board design showing man, pig-iron, corn, hogs and money. 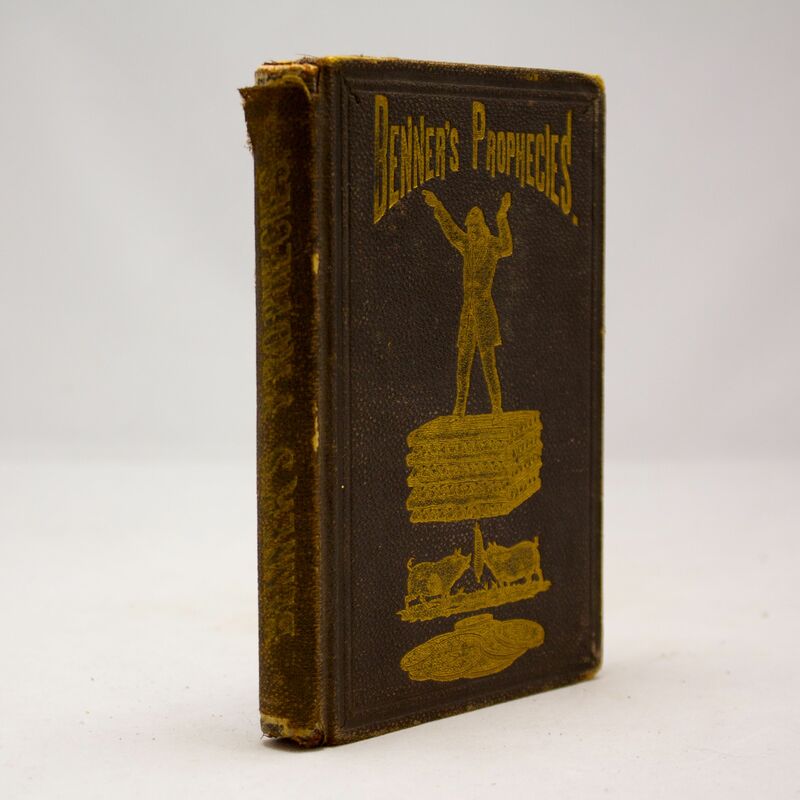 "Benner Prophecies" in large gilt caps on spine. Charts and figures in text. Binding lightly worn and rubbed but a very good, tight internally clean copy of a "futures" book written in response to the panic of 1873 and the losses of a particular Ohio farmer. A financial classic and early reference toi the Efficient Market Hypothesis. * an 11 year cycle in corn and pig prices with peaks alternating every 5 and 6 years. * cotton prices which moved in a cycle with peaks every 11 years. * a 27 year cycle in pig iron prices with lows every 11, 9, 7 years and peaks in the order 8, 9, 10 years. Samuel Benner's book is available at Open Library. E R Dewey, Director of the Foundation for the Study of Cycles, assessed Benner's pig iron price forecasts over a 60 year period. Remarkably, he regarded this cycle as showing a gain - loss ratio of 45 to 1, which was “the most notable forecast of prices in existence”. Benner's pig iron price cycle may be broken down into three series, all of which were based on 9 years and its regular deviations (see Diagram 1). Those years listed by Kindleberger (Appendix B, 1996) as containing major financial crises have been presented in BOLD throughout the text. SEE THE ORIGINAL BENNER CYCLE CHART AS PUBLISHED IN 1875 IN IMAGE BELOW. The 54 Year Panic Cycle arises from panics every 16, 18, 20 years, with this series repeating every 54 years (see upper line Diagram 1). According to Benner, “it takes panics 54 years in their order to make a revolution or to return to the same order”. The key years were 1819, 1837, 1857, 1873 which were all found in the 36 ysc Series 1 of the 9/56 year cycle (see Table A, Appendix 1). Pig Iron Price Cycle Lows of his business cycle occurred or every 11, 9, 7 years (bottom line Diagram 1) repeating every 27 years. The low years were 1816, 1823, 1834, 1843, 1850, 1861, 1870, 1877, 1888. Benner's cycle worked well throughout the 20th century and was a very good indicator of US crises and/or recessions (McMinn, 2004). The links between Benner's cycle and the 9/56 year panic cycle have been covered extensively by McMinn (2004) and thus will not be discussed in this paper. Alas, Benner's cycle is surrounded by some confusion. Either Benner is not given credit as the originator of the cycle or his name is misspelt - Banner and Brenner are two variations given by some sources.